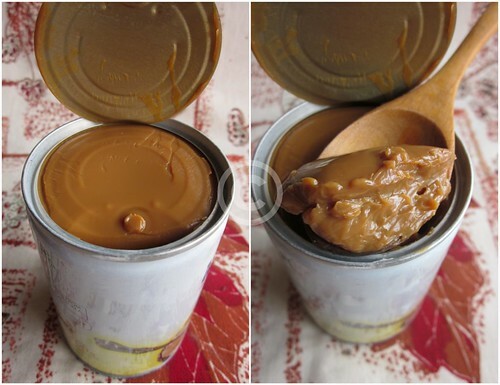 Few months back,I didn't know what Dulce de leche was.Now I am scared of it,why..because I can't resist eating all of it on my own.I always believed there couldn't be anything better in the world than Milkmaid[Condensed milk] to eat straight from the jar,but I've been proven wrong.Dulce de leche is good,if not even better than Milkmaid,ugh,I said it..sorry ms.milkmaid!!! First it was Purple Foodies post,which tempted me to make some of the sweet nectar on my own.But all those horror stories of can burst and all scared me to the boot.Then I got my Vanni to get me a jar.I saved the jar in want of a great recipe to use it.Remember Dulce de Leche Bundt cake? Then came Anushruti with her gorgeous post[as always] and in it I found a very simple method of making this wonder.Using pressure cooker in my kitchen is something which I do on a daily basis,so I decided I should venture into making DdL sooner.I would be lying if I said I wasn't scared of can burst,I even kept away from the kitchen,lol.But let me assure,nothing of that sort happened.It was as simple as making dal,or should I say even simpler than that!! 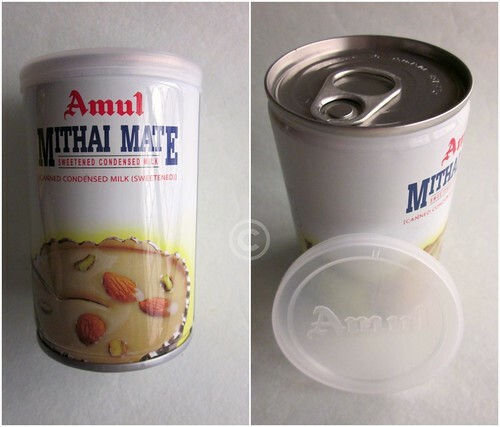 Step 1 - Remove the plastic lid from the jar[If you are using Amul Mithai Mate,or else skip this step]. Step 2 - Fill a pressure cooker with water half way through. Step 3 - Immerse the can into the pressure cooker and close the lid.Switch on the gas on high.Wait for steam to come and then put on the weight.When you hear the first whistle,simmer the flame and let it cook for 30-45 minutes[depending on how thick you want your dulce de leche to be].I cooked for 30 minutes and I got a thick textured DdL. Step 4-Switch off the gas and let it cool down to room temperature. Step 5-The hardest part-wait for the jar to cool down.Let it cool completely and refrigerate if not using immediately. Once it is cool to the touch,open the can,plomp yourself on a bean bag with a spoon and dig in,and use it in whichever recipe you like!! Dulce de Leche Brownies -- Done! Watch out for what I am going to make..very soon!! Did it taste like doodh peda! did you finish the whole thing..!looks intersting. i had never heard of this before. Wherez my comment gone..? not to be seen..! Divu..really looks yum..this wd be the first D-d-L recipe which uses close lid technique..the others I read, kept it immersed in boiling water, (being very clear not to put a lid on for fear of explosion) for 2 hours..rest technique being same! Wow..for the end product! :) Tks for sharing this technique! I know wht you mean by afraid of Dulce de leche, like you I can nver stop eating them and by tha ti mean striaght from the tin. What??? Is it really that simple to make? I had no idea that it is so easy. You've scared me by mentioning can burst, but one of these days when i feel brave enough, I will try it out. 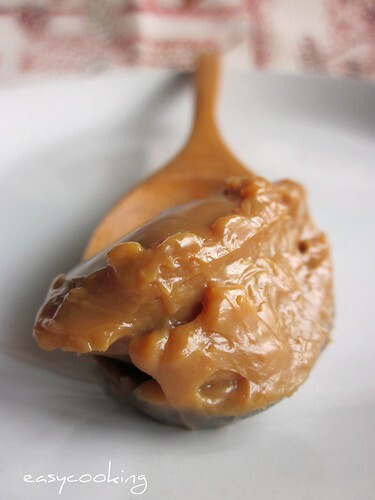 I'm glad you found this easy way to make dulce de leche Divya. It is irresistible...isnt it? There is an unnecessary fear in the west w.r.t the use of pressure cooker. As we know, it is indispensable to our cooking and if basic safety rules are followed then there is no cause for fear. Looks cool and waiting for ur DDL recipes.. Thanks for the suggestions. t luks yum but hw did d color change??? I have attempted this as a stove top version, but this looks much better and more easy! I loved ur pics too! Fabulous. Am an addict to this dulce de leche, love it to the core, thanks for sharing.. I havent heard of this before... Looks so yummy and creamy..
David Lebowitz has an even simpler solution- to pour it into a dish and bake it in the oven! Its only more dangerous because it's so much easier to make and hence be consumed! Excellent DdL, Divya. I knew the oven method ,but never tried that also. This is workable. wow, it looks so tempting and wonderfully explained in steps. Thanks dear. OMG. You giving me ideas. And now I'm scared. I'm just a few walking steps away from a can and a pressure cooker. God Save me. Sounds so yummy and looks irresistible! Tried it out and loved it, Divya....again, I am amazed at the simplicity of this creation. Am now thinking of different recipes I can use this in. Thank you for sharing. Hey Divya, even it can be made in mcrowave also.f u knw the recipe pls let me knw.- RAJASREE. Amazing! And we struggle so much to make thiratti pal!! I love DDL.. make it regularly, but on the stovetop. I need to try this way too!! i've been drooling over this ever since I saw this post, but a bit scared. Now that I've made up my mind i'm gonna try this. plz clear my doubt. will 3ltr cooker be sufficient to do this? Tried this out EXACTLY as you have written. It's absolutely out of the world. You have given me an awesome dish to eat and to make people happy with. Thank you so much! I searched a bunch of sites, but wasnt sure what would work in India. Your Amul Mithai Mate and homely pressure cooker setup so much like my own gave me the confidence to go for it. Thanks so much... am really very deeply gratefuly. Even I came across this term recently and did not know anything about it. Thanks to your blog, now I know how to make it at home and use it to make a cake etc .. But I have a doubt .. after the first whistle, one simmers the heat and for full 30 minutes you keep cooking (so many whistles will happen in the period) .. there should be more that sufficient water to completely soak the can right? Yup,there should be enough water for the whole 30 minute cooking period. Finally I made thisShould I tell you how it tasted? :) I have been eating it daily. Thanks for the pressure cooker idea. I was planning to make it in an open pot. You can use any leftover DdL in your fridge in an airtight container.I have kept it for about 2 weeks without any issues! Hi divya.. I made this earlier this week following your recipe and folded it into whipped cream. . It made the most delicious caramel whipped cream I've ever tasted.. it was just heaven.. Thank you!!! Can you make more than 1 can at a time?